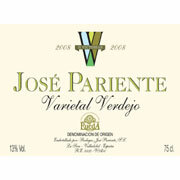 Wine Review Online - Verdejo from Rueda: Spain's Best White? Verdejo from Rueda: Spain's Best White? A key aspect of the amazing renaissance in Spanish wine during the past 15 years has been the emergence of world-class white table wines made from indigenous grapes. Not long ago, white Spanish table wines were quite rare in export markets, often limited to whites from Rioja that were boringly bland or lamentably oaky. For all but the geekiest of consumers, Spanish wine was either red or it was sherry--which many didn’t regard as wine at all. This situation has changed dramatically during the past decade, and today Spain exports hundreds of thousands of cases of white table wine to a single country like the United States. An impressively large proportion of this is premium wine, as much more of it is priced above $12 than below. Now that Spanish whites are available in significant numbers, attention has inevitably turned to evaluating them comparatively. Similarly, particular regions exporting whites from Spain have turned from selling themselves as curiosities and started seeking stature by claiming to be the best that the country can offer. I heard such claims being made for renditions of Rueda’s Verdejo grape while tasting extensively in the region last week, and I also tasted enough impressive wines to take the claim seriously. I found plenty of evidence to indicate that Verdejo from Rueda is indeed Spain’s most consistent white. It is also probably the most versatile of the leading whites as a partner for different foods. Moreover, it offers the strongest value of the top contenders, with almost all of the wines priced in the teens, and many of the best clustered around $15. But is it--all things considered--Spain’s best? Rueda is a legally delimited winegrowing region (or “D.O.” in Spanish wine lingo) located northwest of Madrid in the province of Castilla y Leon. Wine grapes were grown there by the Romans, and it seems clear that the Verdejo grape was brought to the area by the Moors about ten centuries ago. Rueda is situated cheek-by-jowl with Toro, which is famed for robust reds, but almost everything vinous in Rueda is white. Although other grapes like Viura and Sauvignon Blanc are grown there (along with a few very rare red varieties), Verdejo has emerged as the undisputed star of the region. And when I say “undisputed,” I mean it: I never heard anyone offer a single syllable in favor of anything else, whereas everyone working in Rueda seems to believe that Verdejo is their ticket to the top. Days during the summer are hot and dry in Rueda, but that isn’t the whole story in terms of climate. Summer arrives relatively late, and if you ever think about trying to catch some rays in this part of sunny Spain in May, you should think twice. Temperatures were still dipping to the freezing point at night last week, and I was hit by hailstorms on two occasions. Even during the summer, swings in temperature can be very dramatic--to the tune of 40 degrees Fahrenheit from day to night. These wide swings are principally a function of altitude, and those who are unaware that Spain is essentially a giant plateau might be surprised to have a look at their airplane’s altimeter after landing in Madrid. The Rueda D.O. ranges from about 2,200 feet near Valladolid to over 2,500 feet above sea level closer to Segovia, where one can find very old vines struggling to find warmth, water and nutrients at the margin of survivability. Diurnal temperature swings are crucial for slowing the ripening process and helping the grapes retain their natural acidity. Climate aside, the Verdejo grape variety starts with a tendency to hold an abundance of acidity, which helps to explain how nervy whites can be made in such close proximity to the ripe reds of Toro. Another piece of this puzzle is that nearly 90% of the appellation’s grapes are machine harvested--rapidly--during the cool of the night. This is the point in the daily cycle when the grapes are highest in acidity and in aromatic compounds. Only trellis-trained vines can be harvested in this way, whereas older, head-pruned vines must be picked by hand. However, virtually everyone agrees that old vines produce the most concentrated and flavorful fruit, and some plots of very old Verdejo vines are now being used for special high-end bottlings that are among the D.O.’s best. The region is marked by modest internal diversity in terms of soils and microclimates. My sense is that there’s more differentiation among the different sub-regions within Rias Baixas, which is home in Galicia to Albariño, Verdejo’s best known rival. Similarly, there is more variation in growing conditions separating other Galician D.O.s such as Valdeorras and Ribeira Sacra, which is home to Godello, the third of Spain’s leading trio of whites, as well as the less well-known Loureiro and Treixadura. Nevertheless, differences in altitude make for notably warmer conditions near Valladolid than in the areas closer to Segovia, where harvesting can start as long as two weeks later. The three basic soil types are alluvial (i.e., rounded riverbed stones), sandy and calcareous (limestone). Stony soils with some sand content are considered the best, and zones with this profile are planted almost exclusively to Verdejo--which is a commentary on the primacy accorded to this variety. If Verdejo from Rueda will be new to you, seek out a fresh rendition, which means 2009 vintage at the moment, with the new vintage becoming available each spring in export markets (though some producers actually bottle wines from the autumn harvest before the end of the calendar year for their Spanish customers). Once you find one or two of these to try, which should you expect them to taste like? You’ll usually see pale straw color, and find the wine light-bodied but leaning toward medium-bodied. The lead aroma is usually akin to dried herbs, with more subtle suggestions of flowers (especially lavender) and occasionally a suggestion of wild fennel or anise. The fruit flavors are usually suggestive of stone fruits, especially peaches or nectarines but sometimes fresh apricots, and you’ll usually find citrus notes in the finish along with lots of zesty acidity. Some wines will show a hint of bitterness in the finish, and at low levels this can be interesting rather than off-putting, though many winemakers will leave just a little residual sugar in the wine to counter any bitterness. Returning to my initial question, my conclusion is that Rueda Verdejo really does merit serious consideration for the title of Spain’s best white wine. In fairness, it must be said that the best renditions are no better than the best bottlings of Godello (e.g., “As Sortes” by Rafael Palacios) or Albariño (such as Pazo de Señorans or Fillaboa). However, Godello remains so rare that it can’t compare favorably to Verdejo from Rueda, which is now being turned out by more than 50 wineries with an extremely high average of quality. Rias Baixas turns out lots of different Albariños, and the best of them are superb, but a distressingly high percentage of them are watery and lacking in aromatic impact and depth of flavor. Since Verdejo from Rueda is more consistent, more affordable, and at least as versatile with food, its claim to be Spain’s best white is a strong one.